A 90-year-old woman was taken in stable condition to a hospital after crashing her car into the O Lounge at 1349 Kapiolani Blvd. yesterday morning. 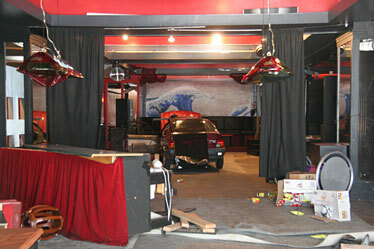 The car apparently traveled from the second-floor parking area, crashing through the glass doors and continued inside, destroying the karaoke bar and ending up in the bar area, a witness said. An employee had just stepped away from the nightclub when the crash occurred. No other injuries were reported. The Rev. 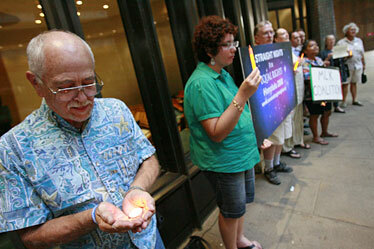 Mike Young from the First Unitarian Church held a candle last night during a vigil at the state Capitol for the Seven Straight Nights '08 event, taking place in 38 cities nationwide. Young and approximately 20 others gathered to show their support of equal rights for gays, lesbians, bisexuals and transgendered. At the Bishop Museum yesterday, Japanese tourists got exposed to Hawaiian culture by learning hula, lei making and participating in the museum's La Kulea program. 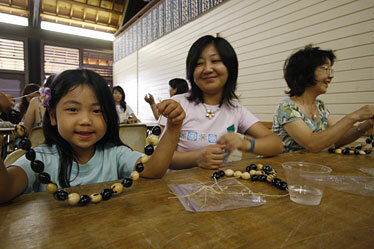 Risa Mitani, left, 6, her mother Noriko and grandmother Sachiko made a kukui nut lei.